Patton Design works with Johnson Controls to create infotainment system. Patton Design creates forms that wrap the body, don't hinder movement, and create security to ensure a positive driving experience. Patton Design creates an interactive control system for Jeep. Invention of interactive control knob for car interiors. 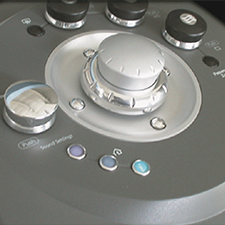 Interactive control knob with icon touch system. Patton Design takes Auto concept from sketches to working prototype in two months.